Is an ONLUS volunteer association with more than 20 years of experience. It is made up of people of various ages that have at heart the well being of children and the prevention of problems regarding minors and adolescents. Every volunteer of our work group contributes according to their personal capabilities and competency. In the importance of children, in values such as family, charity, sharing. These values are at the base of humanity, and need to be inserted in day to day life. 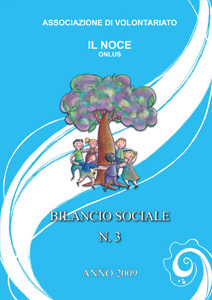 Ourselves to all of the needs of the association “Il Noce”, such as collecting economical and financial resources. We prepare our volunteer group to do the best job possible. We commit ourselves to after school programmes, family support groups for foster children and adopted children, long distance adoptions, community homes for young mothers in difficulty, and food distribution for families in difficulty. Ourselves to children, adolescents, and families of different kinds from foster homes to families where there are adopted children that are in difficulty and in need of help. A safe place that stimulates personal growth, capable of promoting different forms of charity and good actions. We would like to be a modern association, in constant growth always up to date but with a constantly present base of values.